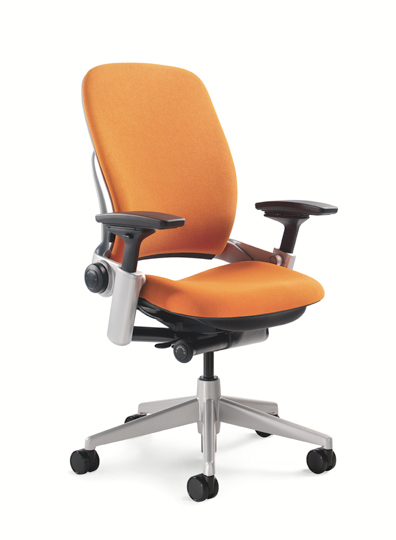 The Leap chair was Steelcase's entry into the post-Aeron market, and so represents their offering of advanced task seating. The Leap is essentially a two pad chair, but they have a range of features that differentiate it from the offerings of other manufacturers. I'd have to say that Steelcase has always offered solid product in seating and otherwise, but they have not tended to break new ground with design leadership. 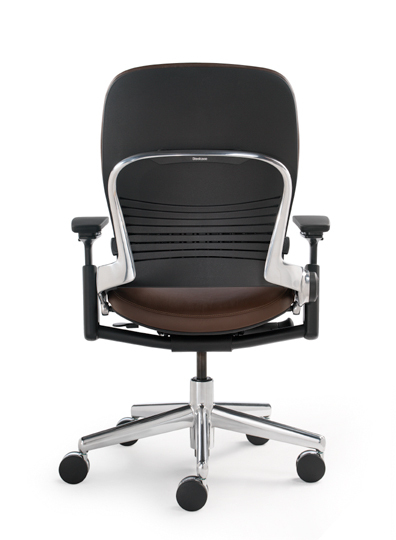 While the Leap chair was not the shining star that the Aeron was for Herman Miller I'd have to say it was probably the best and most innovative chair they had ever put out and well worth a close look if you are looking for a chair. 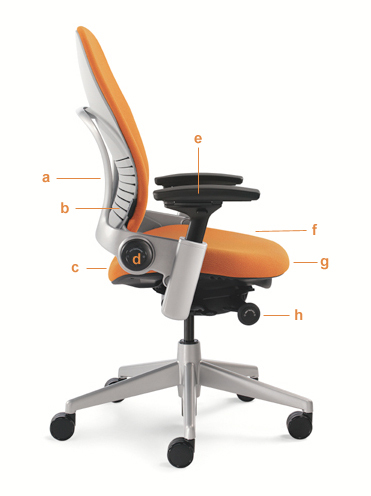 • The Leap's most disinguishing feature is its segmented back pad. Instead of a static shell to form the pad the structure is articulated, like your spine, to allow the pad to be adjusted in ways that are not possible with other chairs. The lumbar support, the height, the resiliency of the pad can all be tuned to your liking. • The Leap claims to use a unique foam which promotes air circulation - a hedge perhaps against the Aeron's mesh construction. • The seat pad is adjustable forward and back which again helps the chair accommodate workers of different stature and build. More interestingly the seat pad becomes dynamic during the recline motion, sliding forward with your seat as the chair back reclines. This is a motion that you might recognize from a Lazy Boy recliner! • Arm pads offer an inward pivot to support your elbows for keyboard work. I think this is an essential feature in todays computer centric workplace. However the arms are mounted to the undercarriage rather than the back and its likely that they will not move with reclining posture. Not a big deal - most of us are not typing in that position, however I do count myself among the ranks of slouching typists! What can I say - sometimes it matches the mood I am writing in..
Notice that I'm never talking about what fabrics or colors the chairs come in - they all are offered in a range of pleasing finishes. Frankly, how they sit is so much more important. Heaps more info at the Steelcase site. Seek it out. I have the Think chair from Steelcase and I could not be happier with it. We are even thinking of buying my wife one too, now that she has her own home office. Is the Leap supposed to be better than the Think? I think the Leap is their best chair, not that the Think would not sit well too. They are different designs, with the Think using a mesh based back and a seat pad. The Think costs much less too. But I'm glad to hear you are sitting in a good chair David. Its money well spent. Yea, it really is worth the money if you are sitting in it all day!